Within walking distance of Carriganass Castle is another historic monument, this time one that existed long before Donal Cam O’Sullivan set out on his fateful march to Leitrim. Kealkill’s magnificent stone circle is one of the most striking examples of megalithic architecture in Ireland. It’s made up of a circle of five axial stones, with a further two stones nearby, the tallest of which is over four metres high. A small cairn is also located close to the circle itself. While the walk from Carriganass through the village and on up to the circle is not for the faint-hearted, the views from there, across Bantry Bay towards Beara, and out towards West Cork’s highest peak, Knockboy (Cnoc Baoi), are breathtaking. From the castle gates, turn right to rejoin the main road. Turn right again to head towards the car park and follow the signs to Kealkill village, taking a left turn up Lucey’s hill to the centre of the village. Cross the road, and walk up Chapel Hill, to the left of The Brown Pub. At the top of the hill by the church, turn right. From Kealkill’s Church of the Immaculate Conception, there are fine views across the valley, a glimpse of the even finer views available when you reach the Stone Circle above it. After 300 metres, take the left turn, signposted for the Stone Circle, and make your way up the winding road upwards for about 1km until you see on your left the gate for the Stone Circle. Use the pedestrian gate here to gain access to the Stone Circle itself, following a rough track for about 200m from the road. The Stone Circle offers spectacular views across Bantry Bay to the west, Cnoc Baoi to the north, Mullaghmesha to the south, and the Sheha and Douce to the east. Includes a fairly steep uphill walk. Kealkill today is a vibrant village with an active community, dedicated to making the area attractive for visitors and residents alike. 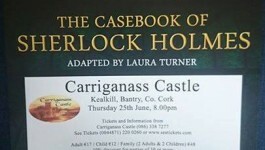 The Carriganass Development Association continues to work tirelessly to develop the castle area, and the walking routes that criss-cross the surrounding area. 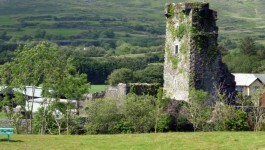 Kealkill's Tidy Towns Association is very active, and is working to develop a new parkland area within walking distance of the castle. The group organises regular walks from the castle. A family fun run takes place on Ladies' Day (15th August) each year, and the annual St. Patrick's Day parade (17th March) draws great crowds.